As adults we can change the lives of children simply by performing a simple, pleasant activity every day. This enjoyable activity can give them real advantages when they begin school. The more they hear, the more they know. The more they know, the easier it is to learn. When children find learning easy they find it enjoyable. Reading to children gives more than just pleasure. Your child will learn to read without being taught. Reading aloud early in life rapidly develops their speaking skills (they can’t- don’t learn to talk unless they are spoken to). They learn about books, words and how words work. They gain new ideas and understandings. They learn about rhyme and rhythm through listening to well written, repetitive stories – many times. Books and stories can help children understand new experiences – going to hospital, a new baby. Books and stories can help children sort out their feelings about themselves and other people. They can tell children more about their world and the world beyond. They can learn about how people live in other countries. Children will have more words to enable them to express themselves more clearly. They will have a high self-esteem because they have been given quality time and learn that they are important and worthwhile. When you read to children, they know you love them. Reading has a calming effect and you can both relax, enjoy a book together and shut out the rest of the world. Children develop the ability to concentrate, relax and feel secure, especially when reading is part of their regular routine. Sitting close together while reading a story or looking at a book can be comfortable and comforting. Stories also give parents and children something to talk about together. The first day of school is too late for a child to begin to read. Children’s brains begin to develop from the moment of birth. Crucial connections that determine how clever, creative and imaginative a child will be are already laid down by the time a child turns one. The foundations of learning are set down from the moment a child first hears the sounds of people talking, the tunes of songs and the rhythms and repetitions of rhymes and stories. Children who have not been regularly talked to, sung to, or read aloud to from birth find life at school much more onerous than they would otherwise. In particular, learning to read becomes a major stumbling block rather than a surprising delight. Children need to hear a thousand stories read aloud before they can begin to read for themselves. At three stories a day that would take one year. Reading aloud from birth prevents reading problems from occurring. Children have learnt what books and learning are about. When they begin school they know what reading is for and enjoy learning. They have got a huge wealth of background knowledge and understanding to bring to the learning task. Everything makes sense and they have confidence in themselves as learners. Their attitude is a positive one and they are more likely to work harder and achieve. It is never too early – or too late - to read to children. The more language they hear the more they are able to use. The more they know the easier they find new learning. Parents should share words, pictures, viewpoints, the rhymes and the rhythms, the feelings of the characters encountered within the pages of a book. Engage children in conversation around what they are hearing. The more we talk to our kids the brighter they’ll be. Talking about books sharpens children’s brains and helps develop their ability to concentrate. Children can use the language learned from books in their own situations and this can help them to solve problems logically. They learn words and language that they would never encounter in ordinary speech. They learn different ways to say things. They learn how authors say things in different ways. Television provides language input, but that alone is not enough. It does not develop speech. Talking is what language is all about. Families and whānau who support and encourage their children to learn can make a huge difference to what they can achieve with their learning. You can borrow books from your local library, free of charge. Take your children with you and help them choose their own books. This is a good way for them to see lots of books and learn to choose the ones they like best. The librarian will help you find books at your child’s level. 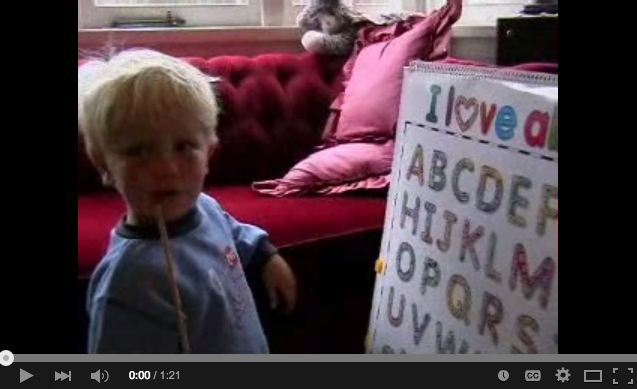 With the right environment a three year old can recognise and learn the letters of the alphabet. Parental input is the biggest factor in children's success. A good news story about Faith Jackson, a non reader who turned into a reader and now devours books. A positive example about the power of reading to children. Education is the key to future success. Teach children to love reading so that they have access to the knowledge they need to become whatever they want to be.